Every man should own a pair of high-quality, eye-catching, Italian luxury shoes. Actually, two. One in black, one in brown. I understand that many of you have budgets, so I do NOT recommend wasting your entire fortune on 10 pairs of shoes that are pricey and extremely high-quality. But you do need to bite the bullet and get at least one or two pairs that will dazzle people. That’s why today I’d like to show you a pair I received a few weeks ago. The “Clayton” from the M. Andrews Sartorial Luxury Collection. It’s pretty impossible not to agree that these are gorgeous shoes. However if you’re looking to buy a pair of italian luxury shoes, or really any kind of luxury shoe, you need to really understand why they’re worth the extra price. So what makes them kickass? Handmade – The shoes are stained and stitched together by hand. This is the creme de la creme in terms of making shoes, since most are done via machines. 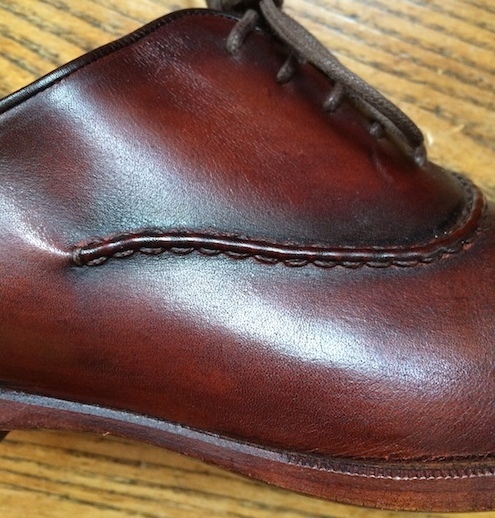 The shoemaker even hand burnishes the toe with a darker stain to give it a little extra punch. You can see the extra detail in person much better than you can through a picture. The hues are extremely deep and rich, and sparkle when polished. Crafted From Italian Calfskin Leather – The leather that makes up the shoe is extremely soft and supple, yet firm enough to keep the shoes together properly. I’ve worn them probably about 8x by now and the shape is holding up beautifully. That’s because of the Italian calfskin leather being used. Leather Sourced In A Crust State – Obtaining leather in a crust state (i.e. “without color) is important in high quality Italian luxury shoes because it allows the shoemaker to start with a blank canvas. By doing this they control more of the coloring and finishing process so you get more deep, rich hues. 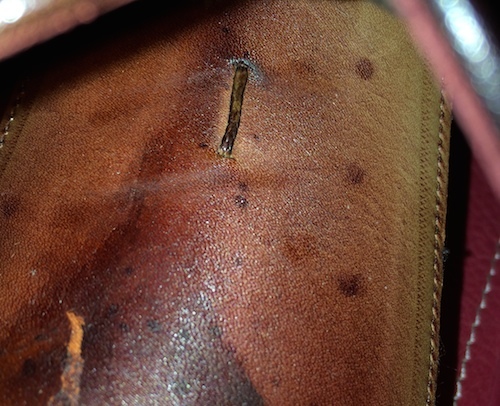 Blake/McKay Construction – When handcrafting the shoes, the shoemaker uses leather soles and stitches them to the upper using Blake construction. This is the golden standard of the Italian shoe industry and allows for more flexibility and extremely close-cut soles. The ONLY problem I had with this shoe is that the color was a little different than what is shown on their website. They’re infused with a much more deeper level of red hues in person than portrayed on their website. Does this make them any less attractive? Not really. It depends on what you’re looking for. From the (various) compliments I’ve received while wearing them, what makes them stand out is the fact that they’re slightly different than a typical brown leather shoe. The only problem I have is that when you’re shopping online, you want the actual product to look exactly as it’s shown online. I imagine they used better lighting to get their pictures. That’s great in that it gives you more clear pictures, but it also brightens the shoe and in a case like this, portrays something different than the finished product. Also, they are hand colored with hand burnished toes, so it might be a simple case as them explaining that each pair has its own unique personality, with slightly different hues. The Clayton is a cap toe, lace up oxford. I’m a huge fan of cap toe oxfords because they are so versatile. I’ve worn them with a suit, but I’ve always worn them dressed down with a pair of jeans and a blazer. For this specific pair, you might consider them being your standout piece that grabs attention when you’re out. You’ll find a million ways to pair them with your favorite outfit, whether your top half consists of a dress shirt… great sweater… blazer… or whatever else you’re wearing that day. I wore them about a week ago with dark jeans and a purple striped button-down and the guy who I was with that day told complimented them, saying “wow, your shoes are absolutely gorgeous, you must have spent a fortune on them”. Go here to check out the Claytons and the rest of their Italian luxury shoe collection. Think of the outfits you have in your closet and do a little mental exercise with me. What do you think would work best with a pair of shoes like these? Shoot me a comment below and let me know. I’d be happy to hear your thoughts on how you could make yourself look stunning in a pair of great Italian shoes like these!